Our objective is to contribute to better outcomes for children and families in Southern Illinois by focusing on the building blocks to self-sufficiency: education, income and health. We're impacting the lives of children and families we serve with a sharpened focus on our community impact. We are rallying all of our assets; funding, volunteers, legislative advocacy, technology, in-kind resources and corporate partnerships to continue to deliver measurable outcomes in a rapidly changing world of service an philanthropy. We measure our success by evaluating following the work of the service organizations we fundraise for. We measure our success by analyzing the donations of school supplies and food we collect and distribute to children and families in need of assistance. We measure our success through the individual stories of those impacted by tools we provide such as the 2-1-1 resource hotline and MyFreeTaxes.com. For more information about who we serve and how, please call our office at (618) 997-7744. 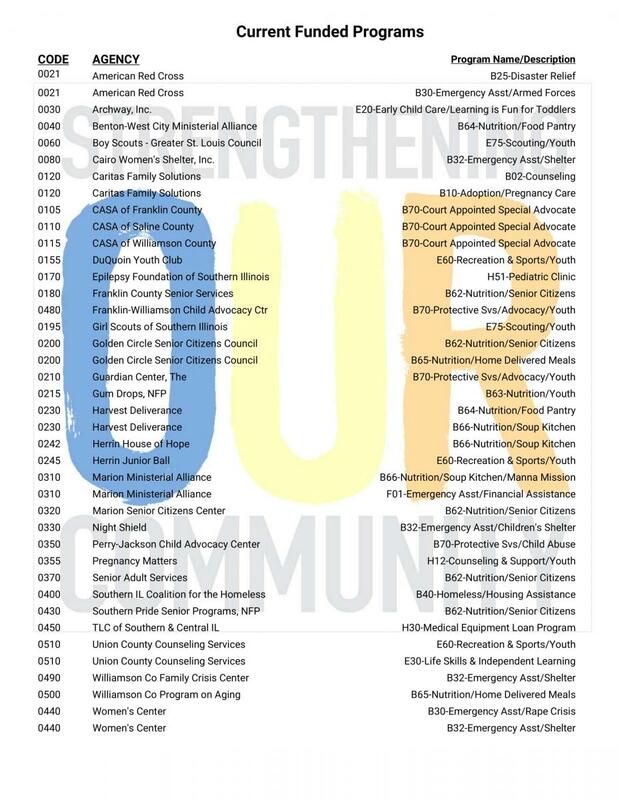 United Way of Southern Illinois serves 14 counties in Southern Illinois with a blend of staff and volunteers dedicated to working at the local level in each county. It's because of this large and varied service area that we approach community solutions through both a regional and a local lenses. Linda DuHamel is the UWSI Administrative Associate: Contact her if you have any questions about: Emergency assistance and/or local information to help those in need; board member, agency, and community volunteers and their hours or service; special event registrations; and the UWSI Speaker's Bureau. Nathan Colombo is our Campaign & Resource Development Director (CRDD): Nathan Colombo is an energetic fundraiser seeking positive social change. He is United Way of Southern Illinois' best point of contact for corporate, workplace, organizational, small business and individual campaigns. Contact Nathan at Nathan@uwsihelps.org or call him directly at (618) 364-8679. If you contact our office and we are unavailable please leave a message and we will return your call as quickly as possible. Resources may also be accessed by calling our 2-1-1 resource hotline. How do I get to the UWSI Office? Our office is located just south of the Town & Country Shopping Center off of N. Carbon Street in Marion, Illinois. We are typically open from 9 a.m. to 4 p.m., Monday through Friday, but office hours may fluctuate depending on our activity. Please call us at (618) 997-7744 to ensure we're present at our office. Our mission is to improve lives by mobilizing the caring power of Southern Illinois communities. We attract and channel people's energy and desire to make a difference. We work to provide for basic needs of individuals in our communities. We effectively measure, analyze, learn from and educate others about the community impact of our efforts. Respect and reflect the diversity of communities in the region we serve.